To support my flyering adventures for the 2012 Melbourne International Comedy Festival, I will be wearing this self designed t-shirt. 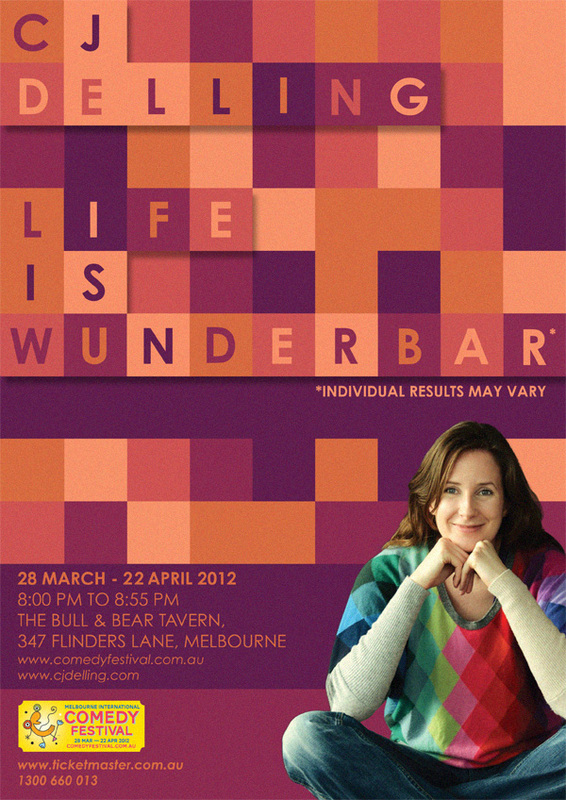 If you see me, take a flyer and come along to http://www.comedyfestival.com.au/2012/season/shows/life-is-wunderbar-individual-results-may-vary-cj-delling/ . 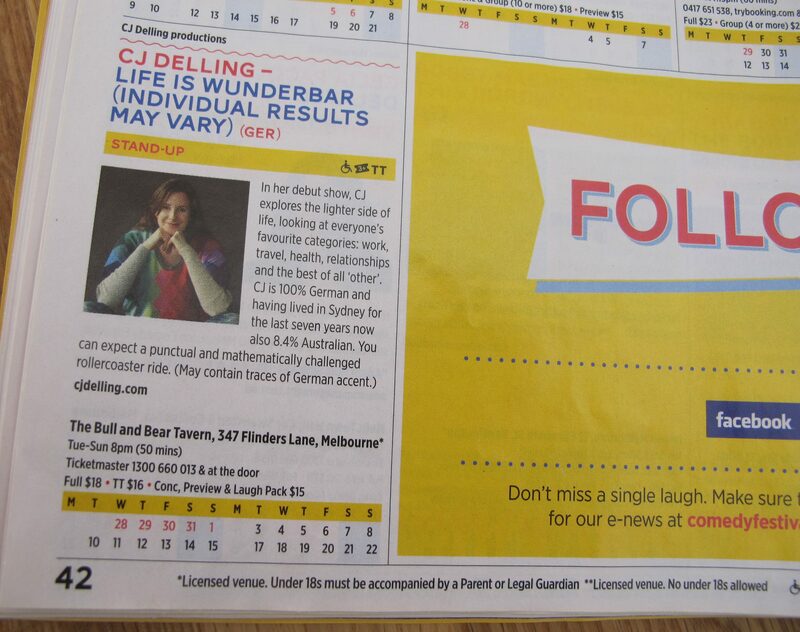 Ah yes, the Melbourne International Comedy Festival program guide has arrived in my letterbox… and there we have it black & yellow & blue on white. Life is indeed wunderbar! 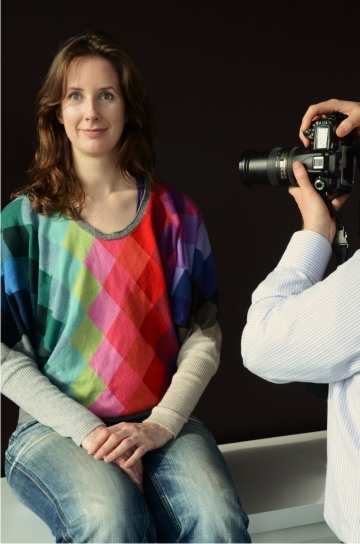 Thankfully I was working with two experienced photographers… eh, yes, literally. I mean that they were actually colleagues from work (my day job) and just happened to be really, really good photographers in their spare time. Lucky me! We tried a few different locations and I even got told off by a security guard for sitting down on an escalater. When he found out it was for a comedy poster he changed his mind and it suddenly was all ok. Go figure! Find a cool and quirky graphic designer through extensive research online and in real life. I can highly recommend www.mikeplum.com should anyone be looking to get some graphic design work done. 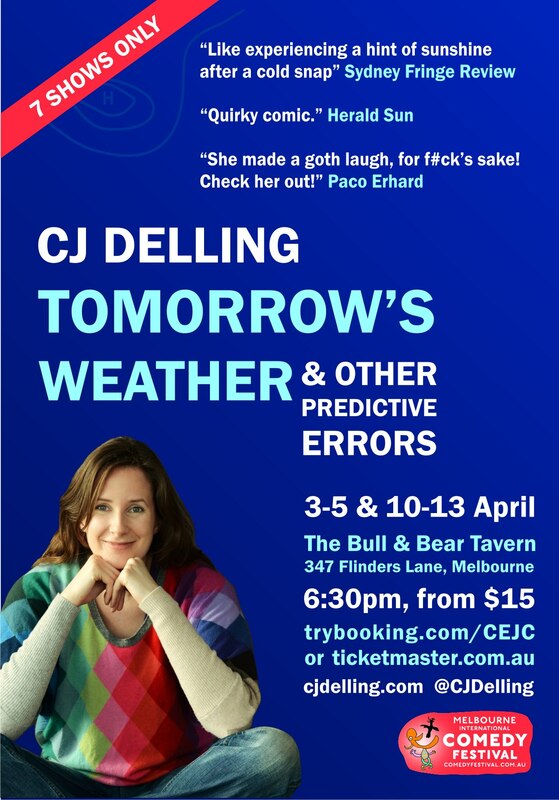 The whole process of entering in the Melbourne International Comedy Festival, writing my show, organising the marketing and publicity side etc. has been quite a huge learning experience. But at the same time, it has enabled me to get in touch with a lot of creative, talented and just simply amazing people and do things I would never have imagined 5 years ago. And the final outcome looks amazing. Thank you again to everyone involved.